When we’re trying to get a relatively complex project to work we often end up with twenty windows open. When this happens we’re usually referencing multiple data sheets, webpages, and trying to write code that the same time. We’ve seen people with two or three monitors to alleviate the situation (often called a battlestation), but the we’re cheap and can’t justify buying more displays just for these occasions. Well [Oscar] may have the solution for us. 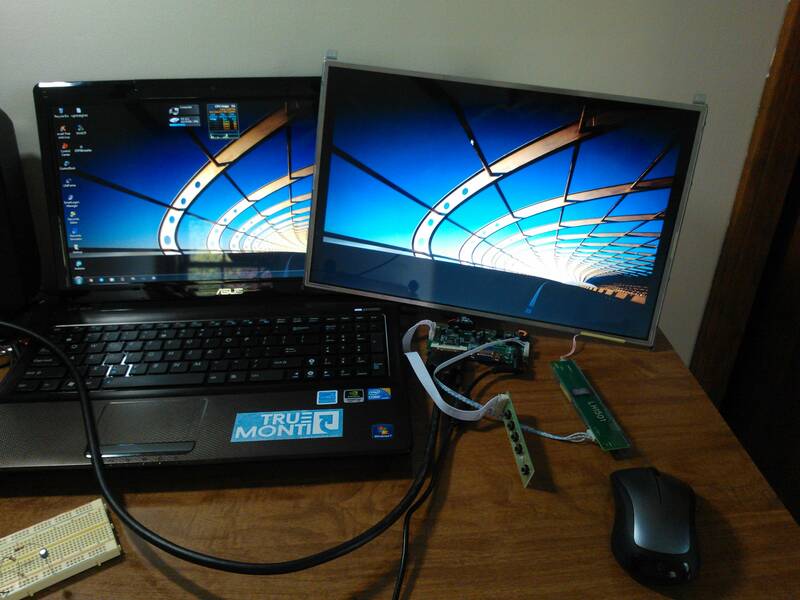 His old laptop had been sitting in a box unused so he flipped the screen and built a stand to position it as an additional display on his desk. The hack simply removed the screen for the hinged cover so that it could be flipped around. This turns the laptop into a tablet minus the touchscreen ability but that could always be added in later (we’ve seen it done with netbooks). He tells us that the only issue he ran into during this process was the length of the inverter cable. He simply cut it and spliced in a little bit of extra length. [Oscar] didn’t write a post about his project, but you can see the build gallery after the break. Is it really a second display ? I don’t think so. It’s just an other pc in your desk. one mouse to rule them all!! or the x2x command if its all *nix. Pretty cool. Good idea are you going to make the HDD and Dvd drive network accessible? Extra storage it always a plus. I did this to make a picture frame. It runs DSL off a flash card. Network connected and pulls images from a network drive. did that too with a PIII. Heavy as hell and the hard disk sounds like an aircraft. I wonder if it fails catastrophicaly. And now… name the anime character! I agree with you. But maybe someone could explain ? Can do pretty easily with http://synergy-foss.org/ — I used to run that to control linux, windows, and mac boxes (each with 1 monitor on my desk). Functioned just like having one desktop spread across monitors. Dude, that is freaking awesome! +1 Million for synergy! Didn’t know that existed. I just tried it out, and wow… Roll between linux machine, win, and laptop all sitting on a desk together from one machine… Amazing. Thanks for the link! My battlestation is fully equipped. I have one primary fancy display and three 17″ LCDs picked up from goodwill for no more than $12 a pop. Auxiliary displays don’t need the greatest resolution or refresh time, so old ones work great. I don’t know where you get old laptops to experiment with. Mine always mysteriously die on me, well past the point of fixability. the story goes that you need a special controller to manage a VGA input to the laptop screen that it lacks and it isn’t cheap. It is possible though. I’ve seen it live. The controllers are cca 20-30 bucks on eBay, depends on what interfaces you want. I have one, works fine as VGA and/or TV monitor. All I can see here is that he flipped his laptop’s screen around and made it’s inverter cable a little bit longer. It also does not look too good. Although I respect his work and the fact he is trying to hack new and useful things out of something completely useless to him, I do not think it is exactly a Hackaday material. I mean, when I read the title I hoped to read about how he managed to make the screen from his old laptop to work as the second screen for his other computer. Did he design a VGA to LVDS adapter? Or maybe he is still booting up that old laptop and using some kind of VNC hack to extend his desktop over the VNC connection to another computer? And after reading this article, the answer is: I do not know. In fact, it is actually impossible to tell if he even is using that modified laptop to extend his desktop or just flipped the screen and using it as a completely independent system with USB keyboard and mouse. I probably would have accepted this hack even if he had a build log with pictures or even if the result looked really cool. Unfortunately there is no info of any kind on how it was done. I mean no offence and I think it is great and all that he made this screen and it is probably very useful to him, but in my opinion, if you are going to share your work with others, you should also share how it was done and what make makes it special (besides the fact that you built it, that is). this i think is still a work in progress for the holygrail of old laptop upcycling. Plus the screen on that laptop looks pretty good, so chances are the laptop as a whole is too. I wonder if it’s fully functional. If so, maybe [Oscar] has something better now, and has no further use for this one. But I bet someone else would have found that laptop useful, and would have bought or traded a monitor for it. I also like to use old laptops as dumb terminals off my lab server which is ubuntu 12.04 with 16GB ram. I run TigerVNC server/client and it works great with old windows 2000 machines as dumb terminals. TigerVNC has bindings for VirtualGL which allows full 3d on the clients, using the GPU of the server. I use old equipment as terminals for my linux server as well. But instead of loading up a *VNC client on MS Windows, I use a Pilot Linux LiveCD. I used to do this a lot. A program called MaxiVista extends your desktop onto your laptop, dunno if there’s better/free out there or if it still works well but when I was in college it’s what I used. Was great for having a spreadsheet and lab report both visible at the same time. If you don’t need your “main computer”‘s display extended, but just to be able to use two screens, Synergy lets you move your mouse between systems’ displays (as though it were two monitors on one system) as basically a KVM over LAN. You can also have a button (scroll lock, etc) switch which system you’re controlling like a traditional KVM. Both of these programs worked way more reliably over wired LAN than with either/both systems being on Wifi. To clarify, MaxiVista is free. Synergy is FOSS. Synergy is also nice if you could benefit from your laptop doing its own processing instead of your desktop doing it all. You can also copy/paste between systems with Synergy. If you share your desktop’s drive you can probably use Synergy just fine for this, as long as you have the appropriate programs on your laptop. UGHHH brainfart. It’s pay. Never was free. Again, we need an edit button lol. And as I type this I think I remember, there’s some way to use some VNC trickery and have a dummy (n-ary) display on your main system and have your laptop VNC into its dummy display, to be used as a second display. I tried that with my Nook Color once and it was laggy as hell, but I’m sure it’s better with actual computers. As a display? We did the opposite and used an old laptop as a co-lo server – for years. It was so good that it managed to roll over the Linux uptime counter at least twice. All on the internal disc. And it didn’t use much power. Wow, this is a terrible HaD post. This may be a hack but it’s so common place that it doesn’t need a new post, especially a post without details or a write up… Shame on you Mike. And he didn’t use ANY arduinos, how can anyone live that way? ur link is a fail :| but what kind of connector/controller is it? totally agree with putting an edit button lol, link is good and does that controller work for all laptop displays? so i guess i need to research my displays, but can you program it to other displays? The controllers can be programmed to other displays, within limits of resolution and refresh rate. I got the seller to program mine (RM5451 controller) for a 1600×1200 IPS LCD from a Thinkpad T43p. If you want to program it yourself, they also sell the programmer for about $50 I think. I think mine came with a set of jumpers that can be used to reconfig it to any display resolution. disadvantage: it takes relative hughe amount of space and most laptops have low res shiny screens. Using a old laptop ( and ceetainly desktop) as “extra” screen also uses rather a lot of power for nothing and add noise (fans, HD etc). A new low/midrange screen hardly costs anything anymore, if $$ is the real factor try to get some dead screens who are going to be junked made about 4 to 5 years ago, i think 99% of those died due bad caps. And dockingstations for (corporate line) laptops rule . Just don’t get that not more poeple use dockstations. they are dead cheap second hand and often fit newest series. I have so many old laptops and wish there was some easy way to just take the screen from each one and hook it up via dvi/vga/whatever. Please someone invent something that can handle every LCD panel out there without any effort on my part! xcfe is garbage. That is all.